Now anyone can afford GN Netcom quality, with GN 2200 Omega™ headsets. GN 2200 Omega headsets deliver professional performance at a value price, so you get a cost-effective solution without compromising sound quality or durability. You get style and comfort, too, in an elegant, lightweight design that's easy to wear all day long. 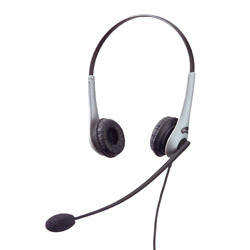 Yet GN 2200 Omega headsets are durable enough to last for years, even under the most telephone intensive conditions. The GN 2225 NC headset is a binaural model featuring a noise-canceling microphone and the GN Netcom extra-strong, ultra-sleek DuraFlex-II™ microphone boom—the first real advancement in microphone boom design since their original DuraFlex boom. The dual earpieces on the GN 2225 block out background sounds and makes it the ideal choice for noisy environments.